I don’t know Bode from booty, but this is the most perfect frequency app for anyone, musician or not, to explore the world around them. Buy now. As the title says, this is an excellent app. It's very hand to have around when checking for acoustic anomalies, or finding the latest hidden picture Easter Eggs in Aphix Twin's music. My only caveat is that the app is still 32-bit. That means when iOS 11 hits, this great app won't work anymore. That is, unless the developer updates it. So, my message to the dev team: please update this bad boy! Not good for much except pretty interface. No technical utility until developer fixes crash on save and allows export of files. Birders could really find this useful for ID of species if dev addresses these issues. Fine potential not yet realized. Nice app. But I wish it was able to process songs and voices from the iPod not just the mic! Very precise, it even shows the overtones perfectly. Excellent for analyzing frequencies of individual tracks in a mix. It's also quite fun to "see" all the sounds around you. I knew there was something electronic ringing in my bedroom that was annoying the heck out of me, and I found it with this app! Well worth the price. This app continues to amaze me and I am particularly pleased the Dev keeps the app updated. Get this app; I highly recommend it! Another brilliant app by Dominick Seibold!!! This app makes use of the high resolution display to visualize microphone input. Remarkably sensitive. Try whistling! One of the simplest and most elegant apps I've tried so far. It always sparks discussion and interest, and makes you more aware of the aural environment around you. This is my main analyzer, it works great! Used in multiple real-world applications... Love this app! It's fun watch the display while it analyzes music, speech or other sounds. You can demonstrate how the harmonics of two tones align to make a pleasing chord. I wish the pause button was easier to hit and that the capture image menu didn't pop up so easily. But overall a good set of options for colors and sampling parameters. Feb. 16, 2015 - what a great update, It’s a great app... The graphical display is great. And the gain sensitivity is perfect, being able to dial it down so highlights are not blown out. The ability to take a screenshot/picture from within the app that is high res and clear is a nice touch. I miss the ability to adjust the frequencies i.e. 8 kHz 22 kHz 44 kHz but a little more real estate in the app is nice... The sensitivity and screen shots are great. The spectroscope, plus the sonogram on same screen with real time... perfect. Ability to drag a guide with note frequency? Even better... I'm using it with a cheap USB audio interface to viz my HW synths... If this could sit in audio bus, that would be really cool.. I was at a concert with a lot of weird sound effects and whipped out my iPad and downloaded this app. I could see the music visualized in a new way! Too much not to record! You can't record? Well there goes 4 bucks down the drain. Merry Christmas. 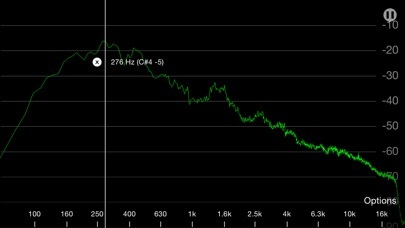 I've used this app to track down the source of high pitched whining noises in my office (multiple power supply issues in the past few years!) and graph sonic differences in musical instruments (comparing overtones and white noise levels between woodwinds). Very useful app, and it's a lot of fun to play with. I just wish the user interface wasn't so difficult to use on the iPhone. I have decent dexterity (small enough thumbs to type fast and reliably, at least before iOS7! ), but the buttons are incredibly difficult to touch. The interface is in desperate need of a stylistic and usability overhaul, but otherwise it's a great utility. Smooth, as advertised, but no zoom, or pan of time or frequency feels like it's "just for show". Ok for that. Peak marker on spectrum would be nice. Able to display intensity, pitch, and formants. Very useful to singers! App crashes whenever you try and save an image from the spectropro on an iPad. Does the job but could use some updating to latest UI standards. 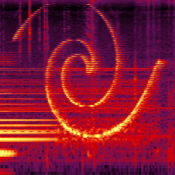 Makes a beautiful sound spectrogram but that's it. No pause, replay or making a spectrogram of a saved sound file. Limited. 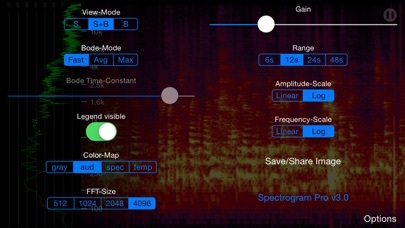 The best spectrograph app, without a doubt. 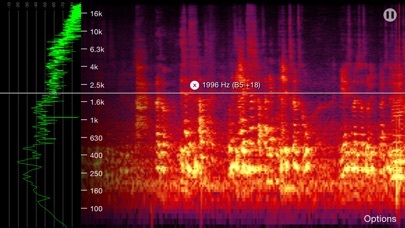 One of the nicest looking spectrograms around, unfortunately it only supports mic input. Does not work with AudioBus or AUM. I really like this app, it's fun to be able to look at sound broken down into it's component frequencies... To be able to really see the harmonics in a voice or a cat purring. I do wish you could scroll the display back in time, or record it to a buffer and save it off as a movie. Though you can reduce the sampling rate and slow it down, which is almost as good.